All of us encounter situations when somebody is really hurting and our heart goes out to them. We wonder how we can help them most effectively. Here are some of my thoughts on this subject. Assess your own ability to help. 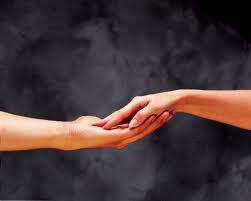 Extend your help only when you sincerely feel that you can help that person. As your first action get into a sincere communication with the person. Be a good listener. Listen carefully to what the person is telling you, without interrupting. Acknowledge appropriately so the person knows he or she is being listened to. Do not offer any advice. Do not comment on what the person is telling you. If the person asks for advice do not give any opinion. Simply provide him with your honest experience in a similar area, but also tell him that it is your experience and it may not apply to his situation. If the person asks any questions then answer him honestly without injecting your opinion. Answer in a manner, which encourages the person to look more closely at his situation. Introduce the person to KHTK mindfulness. Explain that resolution comes rapidly when one looks at a situation non-judgmentally, without resistance, and with enough patience. Guide the person to study about KHTK from the essays presented at KHTK Index. If the person is distressed mentally and cannot use KHTK material on his own then get the help of those who are taking care of that person and apply the materials in the section CLEARING MENTAL DISTRESS. If the person’s attention is too fixed on some unwanted condition then guide the person through the processes in the section CLEARING UNWANTED CONDITIONS. If the person is able to study and apply KHTK materials then supervise him through the materials in the section MINDFULNESS. Discuss and answer any questions the person may have about KHTK. Then supervise him through the subsequent sections. Please note that the contents of what one looks at are individual and private to the person. These contents need not be discussed except in broad terms. What may be discussed are the KHTK materials. Set up a schedule when you are to make yourself available to supervise the person. As much as possible, let the person continue with the KHTK exercises on his own. Always treat the other person gently with humility when helping him in his need. Your reward will come from the improved conditions of the people you have helped. I am still looking at points 10 and 12 above. I feel that more explanation is required here. (a) Ask if he sees as inconsistency what appears as an inconsistency to you in all honesty. (b) Be willing to be corrected in the ensuing discussion on this point. (c) Never press forward with your opinion. (d) You look too while you are asking the other person to look. (e) Do not pursue the point if you feel there is resistance from the other person. (f) Simply acknowledge and take up some other point. (g) Let the other person take time to look over the first point on his/her own. (h) Let that person come back to that point later in future if he/she wants to. Many principles here may be the same as in Idenics, but this is not Idenics. Idenics is proprietary. I am a trained Idenics practitionar and I have used Idenics extensively with great benefit on many people. In my opinion, Idenics is an easy and efficient approach that handles a wide variety of concerns that a person may have. KHTK basically takes Buddha’s technique of Vipassana meditation and tries to express it in modern terms. It is free for anyone to use, and to build up on it further. It is an effort to apply the scientific method to the field of mind. I have revised the OP with the availability of more specific KHTK Exercises. I have updated the above essay to streamline the procedure of helping others with KHTK.